Remember back in the late 1980s when there was a "Black and White Boom" in the world of comics? A multitude of independent companies published a huge number of comic book titles. Printing on newsprint without color was relatively cheap, so why not? Some of the comics were good. Others not so much. One of the great ones was Gnatrat, The Dark Gnat Returns. Cartoonist Mark Martin's storyline was clever and his artwork was both clean and distinctive. The comic was a parodic mash-up of Frank Miller's work on Batman and Daredevil and Ronin. It worked. The comic book was acclaimed. You can give yourself a reminder of how much fun Mark's artwork is by looking here. 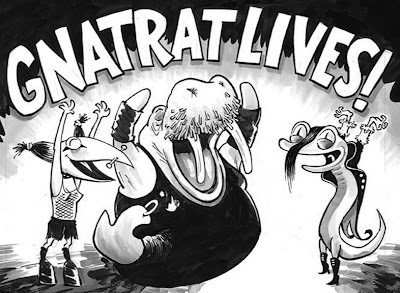 One or two more Gnatrat comics made it into print but then Mark went in some other directions. He drew some Teenage Mutant Ninja Turtles stories for Kevin Eastman and Peter Laird. He became a regularly-scheduled artist-columnist for The Comics Buyer's Guide (welcome to the club!). Plus I always enjoyed stumbling upon Mark's cartoons when I was subscribing to Nickelodeon Magazine in the 1990s. But then Mark Martin dropped off my radar for a decade or so. Last month I sold a Gnatrat on ebay and it got me wondering whatever happened to Mr. M.
One Google search later and I was watching a video of Mark on kickstarter.com pitching a Gnatrat revival! Kickstarter is a website where individuals-with-plans present their concept and invite onlookers to make monetary pledges to help make their concept a reality. When the individual's goal is met, production commences. I very much liked Mark's hierarchical pledge-levels. For a certain amount a pledger's name would be lettered into the proposed Gnatrat story or, for a certain higher amount, the pledger's avatar would appear in the story. I was disappointed that I happened upon the Kickstarter video after the pledge deadline had passed, but I found the video entertaining in and of itself and you can watch it yourself over here. I wrote Mr. M a note saying how much I have enjoyed his work and (what the heck) whether he would consider ruminating on a couple of questions for the widely-beloved Hayfamzone Blog. And he said yes! who his favorite artists of all time were. I asked what current comics series he follows. "None. Sorry about the short answer, but it's honest. in the last year was the Melvin Monster hardcovers." I asked how he makes his living between Gnatrat jobs. anonymous cog in a machine by day." Mark Martin is an American cartoonist known for his humor and satire. Granite City, Illinois is a suburb of St. Louis. 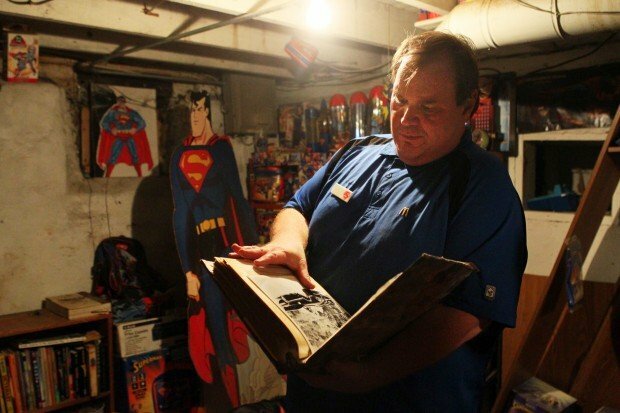 I came across a compelling story, a tragedy really, about a Superman collector who lives in Granite City. Chances are the story did not find its way into your newspaper, so here is the online version. But wait! There is a happy ending to this story and you can read it here. The Hayfamzone Blog prides itself on helping its readers keep up with comics-related current events. One of the comic books I have up for bid on ebay this week is Captain Marvel #4 from M.F. Enterprises. This character is not what anybody thinks of when the phrase "Captain Marvel" is uttered; this comic is the epitome of obscure. That's not to say it's bad, and it definitely has an excellent pedigree; the artwork is by Carl Burgos (who created The Human Torch for Marvel Comics #1 in 1939) and Carl Hubbell (whose comics credits also date back to 1939). The series lasted four issues in 1966 and here is a gallery of the covers. This Captain Marvel's power is that he can split his body into separate pieces at the joints. This may explain why the series lasted four issues. 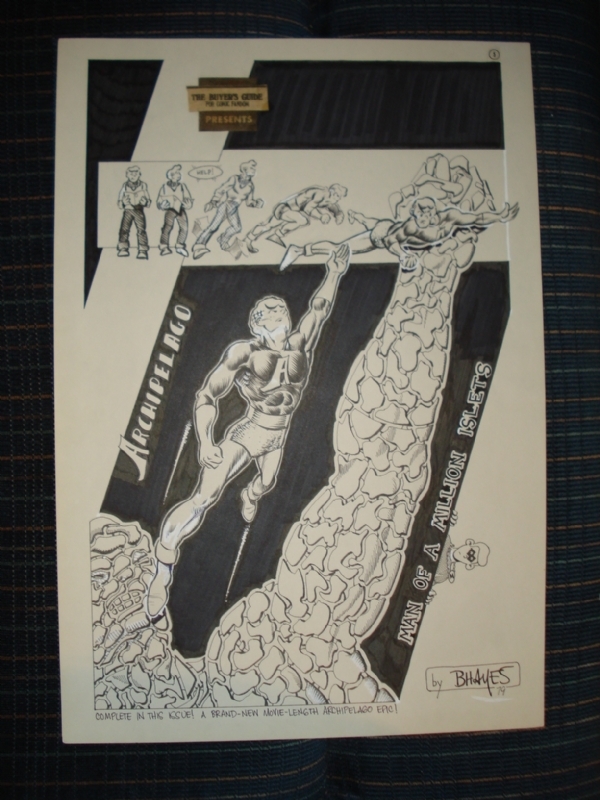 But the comic did make an impression on me when I was a wee tyke and manifested itself in a drawing I did years later. I came up with Archipelago, who could split his body into a million little islands, and who had a visual resemblance to Archie Andrews. I drew exactly two pages of this character. The first is a full-page pin-up that showed most of those million islands in detail (and, peeking at you from behind the wall, there is the M.F. Enterprises Captain Marvel!). The second page is a "movie-length" epic in which Archipelago offers to help a young girl in distress. I had great fun putting it together and Alan Light published it in The Buyer's Guide 29 years ago. Honestly, I can't say if any reader realized that the peeker on the pin-up was Captain Marvel or my character's direct link back to him. The world was a lot quieter back in the days before the internet. You can see a larger view of the pin-up here and you can view the movie-length epic here. The first of the new DC Universe titles has been released. Unfortunately, the 2011 Justice League #1 underwhelmed me. I'll write more about it later, but I doubt that any line of dialogue from it will still be in my head forty years from now. On the other hand, I can cite for you lines written by Jack Kirby forty years ago that are still in my head. In an early issue of The New Gods (it was almost certainly number seven, featuring "The Pact" (which, by the way, was my first encounter with the word "pact")), Izaya the Inheritor stood defiantly before the Source Wall and demanded "If I am Izaya the Inheritor, what is my inheritance?" First off I thought it was so cool that a chap had been going around with a nickname all along and never knew what it meant, and secondly I thought it was supercool that the answer "The Source" was written by the flaming hand on the Wall. In a different early issue of the same comic (either number five or six, because those were the two issues featuring Slig and the rest of The Deep Six as villains), I read in awe as Slig mockingly taunted Orion with "Orion is his very own monster!" 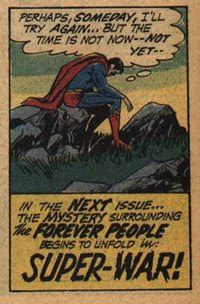 And please don't make me tell again how Superman's uncharacteristically contemplative behavior in the last panel of Forever People number one cemented me as a comic book fan for life. Jack Kirby is pretty much universally admired for his bold concepts and, of course, for his dynamic artwork. Well, I also admire Jack Kirby for his writing.